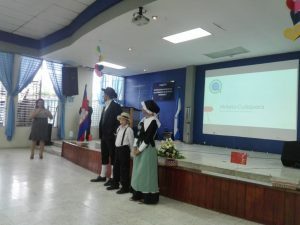 See how the Section of the Americas celebrated World Quaker Day 2018. 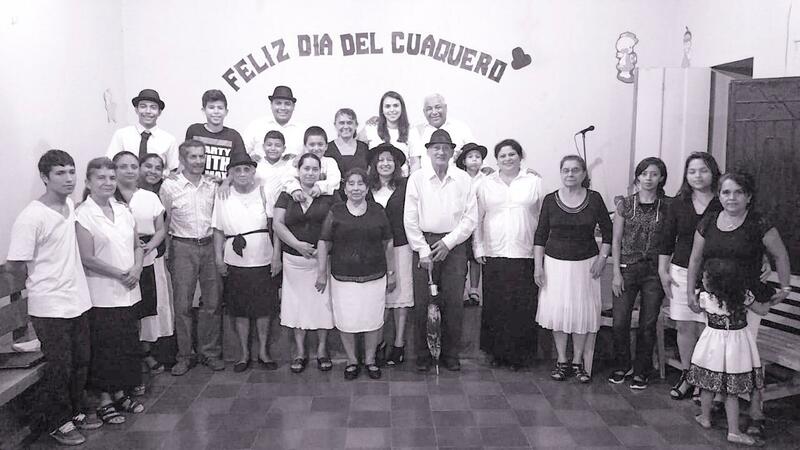 Friends in Belize City celebrated World Quaker Day by sharing a meal after Sunday Meeting for Worship. We had two visitors in the meeting- Carmen Hamilton and Bette Hoover, our AVP facilitators. Carmen is from US Virgin Island while Bette is from Baltimore Yearly Meeting. At the end of the meal, a substantial amount of food remained. Youth at the church subdivided it and packed it in several packages. While I drove them home, I realized they had decided to share the food with several families in the community they knew needed that meal. They lead me to new streets and new places. We stopped by different homes. A young man left the car with a package of the meal, walked to the door and knocked. Someone came and opened the door surprised. A brief conversation followed. The meal was received. We moved to the next home. These youths emerged with a spontaneous outreach ministry. They identified families in need of food. 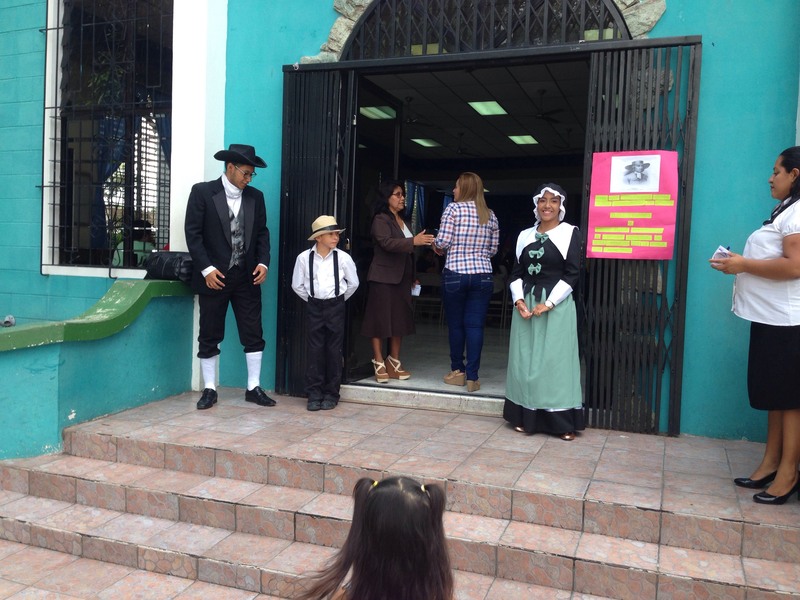 They visited families, told them about the World Quaker Day celebration, the meal and their decision to share it. This experience helped me see how these youths can find creative ways to translate their worship experiences at the church into messages and practices of love and care to the communities they come from. Most of the outreach work over the past year has been done by youth - students who come to church. 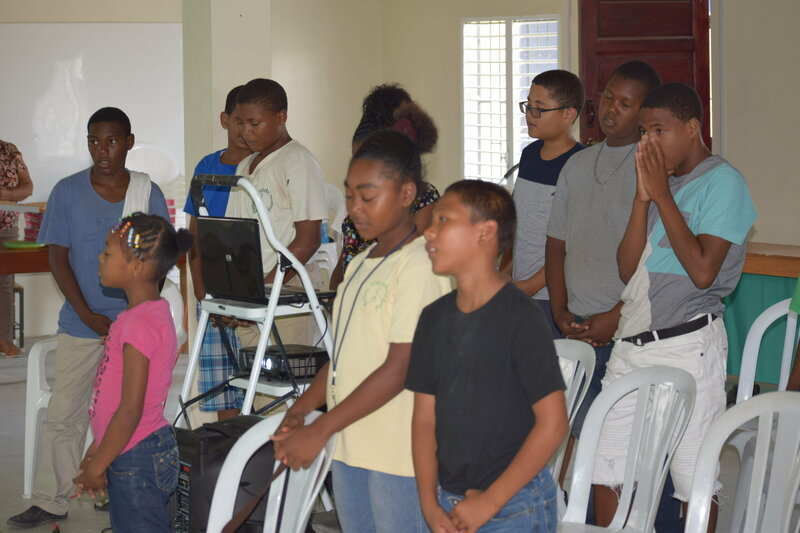 We have 5-10 of the school’s current population of 18 students in Meeting (church) each Sunday, and some who have graduated from our primary school and are now in high school. We want to encourage this trend and learn how best to enhance it. 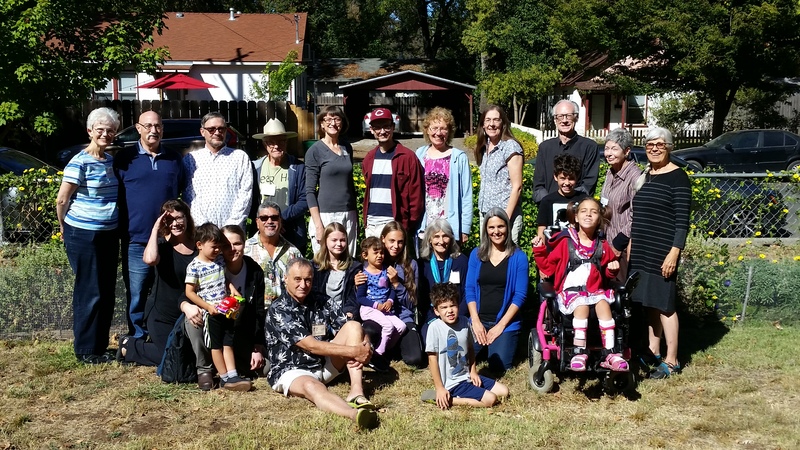 On Sept. 30th, we celebrated the 50th anniversary of our meeting home which seems a fitting tribute to World Quaker Day. 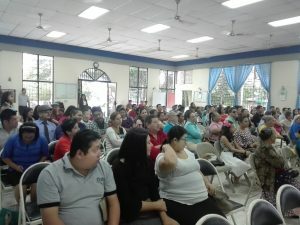 We had about 75 folks in attendance. We had 37 Friends in the photo, ages 18 months through 95 years old. 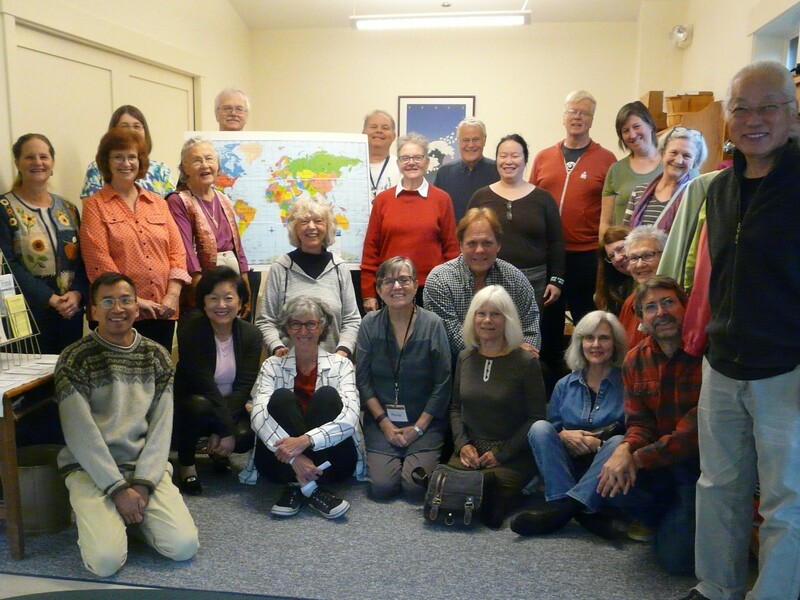 We are part of the Pacific Yearly Meeting and the College Park Quarterly. 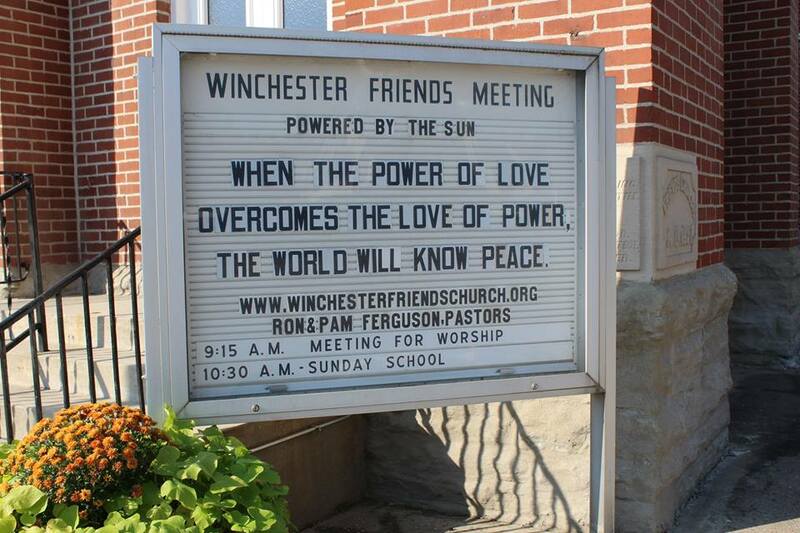 Downers Grove Friends Meeting, Downers Grove, Illinois, US sends our Greetings to Friends around the globe. At the rise of Meeting for Worship we held in the Light all refugees and their children who are being detained and often separated from parents by the US government. We displayed the map which shows where Quakers gather around the world, then used push pins to point to places around the world where Friends from our Meeting had attended other Meetings, or where we have Friends. Then we shared a Simple Meal with donations going to People's Resource Center which serves people in need. Greetings! The First Day School met and we talked about how many Quakers there are in the world, where they live, how we worship compared to how other Friends worship and then we sang songs to show how other Quakers worship. At the end of Meeting for Worship all the children and teachers went into the Meeting Room where we announced that it was World Quaker Day (WQD). We celebrated the day with a cake decorated with the WQD symbol. Greetings to Friends everywhere, from Fallsington Friends Meeting in Pennsylvania, USA. Celebrating World Quaker Day @FCNL in Washington. We hosted a "homecoming" potluck, following Meeting for Worship. One former attender, who had not been to Meeting for more than 20 years returned from across the country to visit us. Our First Day School children and teachers led us in singing in Swahili the popular hymn Wana Baraka. Before taking our annual all-meeting photo and enjoying a typical Zambian meal we heard about a service project in Zambia that one of our teens participated in last year. 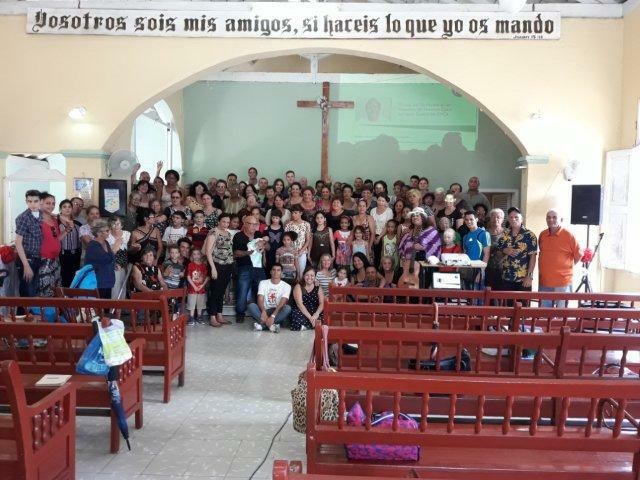 We will share a copy of our all-meeting photo with our sister meeting in la Habana, Cuba. 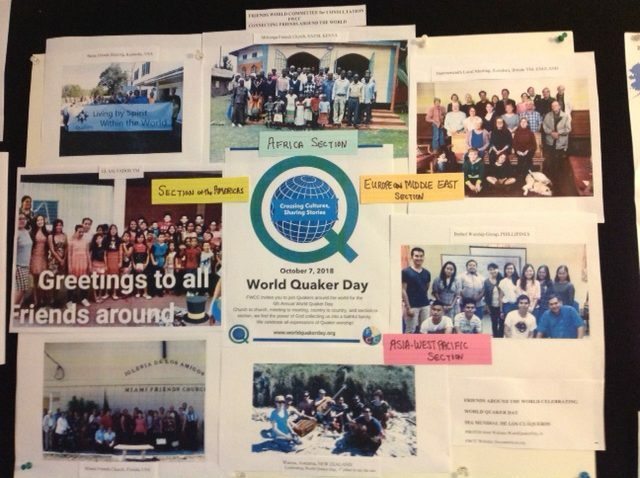 World Quaker Day was an exciting time for Heartland Friends! 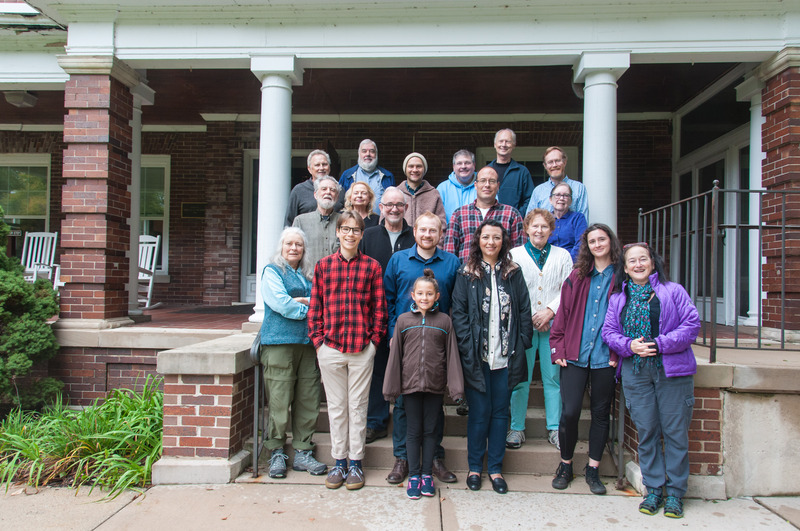 It began with 15 adults walking a new Path of Testimonies designed by member Dean Young for our own times of reflection and as a standing invitation to neighbors to come onto the grounds and learn about Quakers. After walking the path, pausing for brief sharing of six testimonies, Connie Adams told a Faith and Play children’s story about George Fox as an introduction to unprogrammed worship. When the worship hour was done, everyone enjoyed a fellowship meal. What a meaningful and special day! Greetings from Indianapolis First Friends. 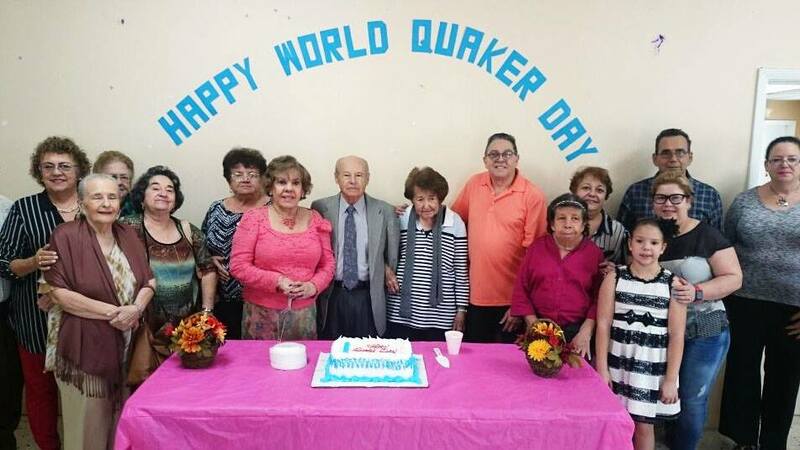 We celebrated World Quaker Day during our Meeting for Worship. Part of the Meeting was a reading of a poem called “The Inner Light,” a special Children’s Message about WQD, our choir sang, “Be Thou My Vision,” and our pastor brought a message about how Quakers work to bring wholeness in our fragmented world. Live Oak Meeting is located in the rich agricultural land of the Salinas Valley. We celebrated with an activity during our Adult Religious Education time. First we went on a virtual tour of Quakers around the world. We closed our eyes and were guided from New Zealand to Hawaii. Then we answered queries about our experiences with Friends who were different from us. Finally the Call of Kabarak was read. It was a sweet time and we got to know each other better. 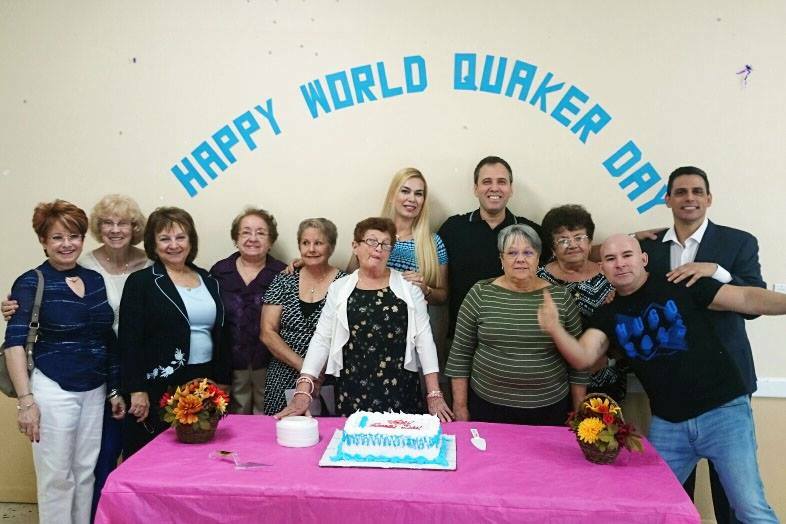 World Quaker Day 2018 at Friends Church in Miami Florida. We had a pot luck lunch with everyone after Meeting for Worship.as well as a Question and Answer session for new attenders who want to learn more about Quakers. We helped out and were helped at the Connecticut Valley Quarterly Meeting at Woolman Hill. 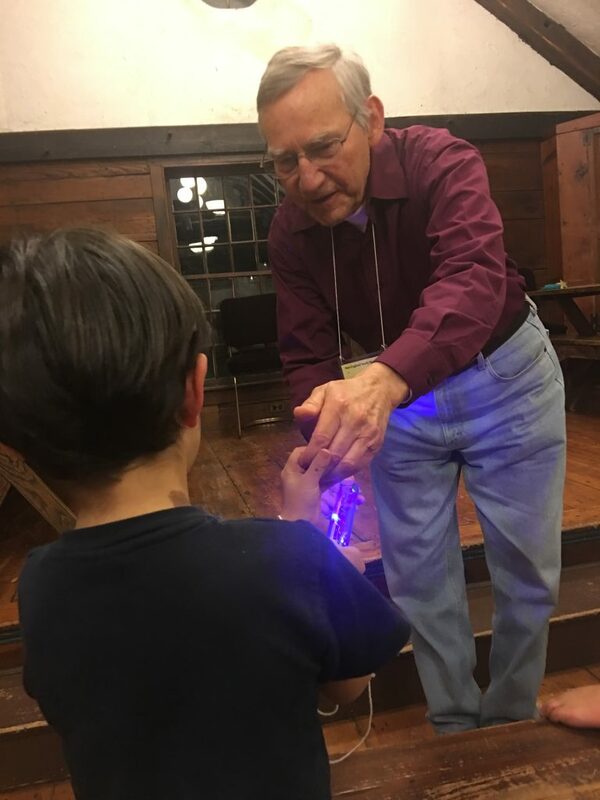 Picture shows friend Jerry Sazama sharing science and spirit with our five year old. 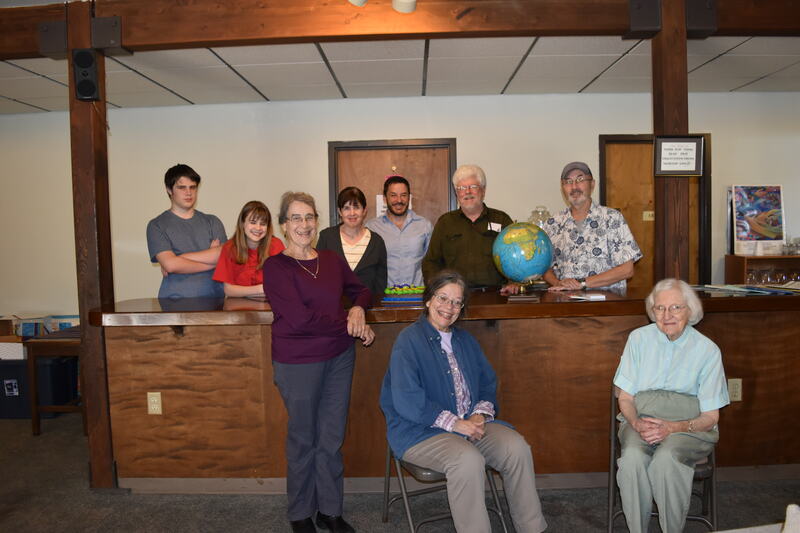 Oxford Friends Meeting in Oxford, Ohio celebrated World Quaker Day with a First Day school lesson in which member Anne Hutchinson shared about the history of Friends in East Africa as well as her recent work there. 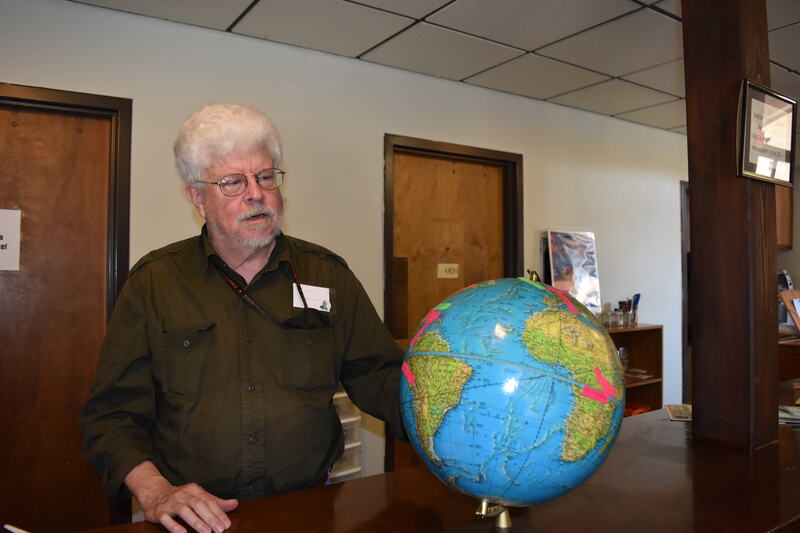 Afterwards, members of the meeting talked about Meetings they had worshipped at in other parts of the world and marked them on a globe. Collectively, we had been to Meetings in many parts of the US, and several Meetings in Latin America, Europe, the United Kingdom, and Africa. We also enjoyed a cake decorated for the occasion. 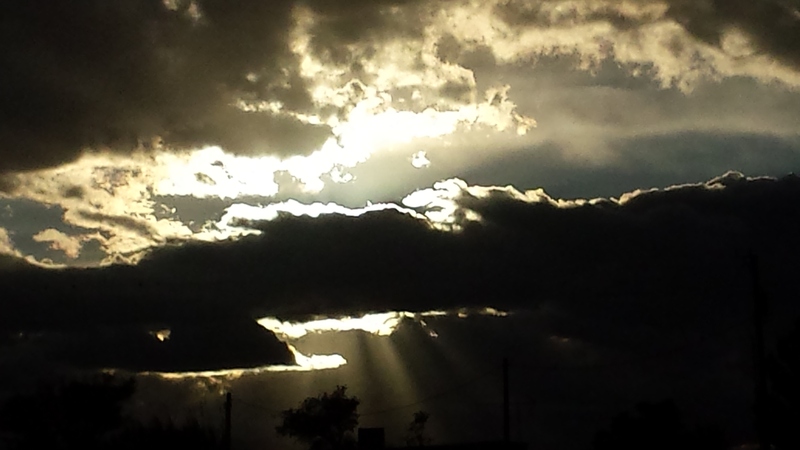 We appreciated this day of fellowship with Friends throughout the world. We canceled announcements following worship and gathered for our first "Conversations With Quakers" to welcome new Friends, visitors and renew Friendships. We served serious snacks. Those who were willing to answer questions about Quakerism or our meeting wore large letter Q's on their lapels. Our children met to see the film of the 2012 World Conference in Kenya and think about what they would like to share about our meeting with children around the world and what they would like to know. They would like to make a short video about our First Day School programs and post it so others can see it. We would like to have an email pen pal or two from other parts of the world or US to share what we do a few times a year. 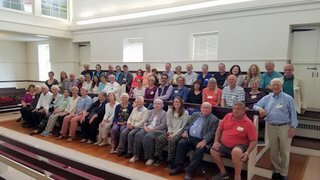 Providence Friends Meeting, a monthly meeting of the Religious Society of Friends, in Providence, Rhode Island, celebrated World Quaker Day with this year's theme of "Crossing Cultures, Sharing Stories" on First Day, October 7th at the Meetinghouse. The First Day School children learned about other cultures and Friends in other countries from Friend Betsy Cazden who spoke about her recent travels and connections with Quakers in South Africa and France. 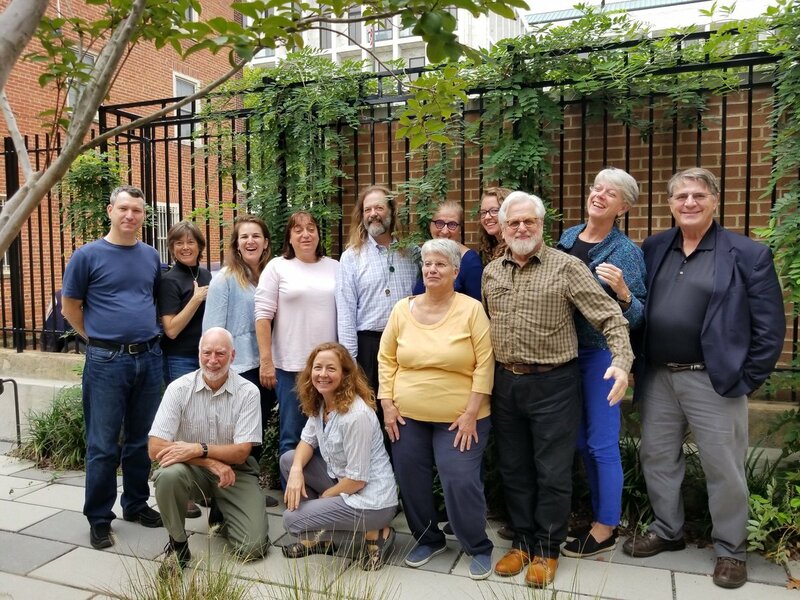 In keeping with the theme of "Sharing Stories," we send out to the Quaker world some of what we would like you to know about our Meeting. 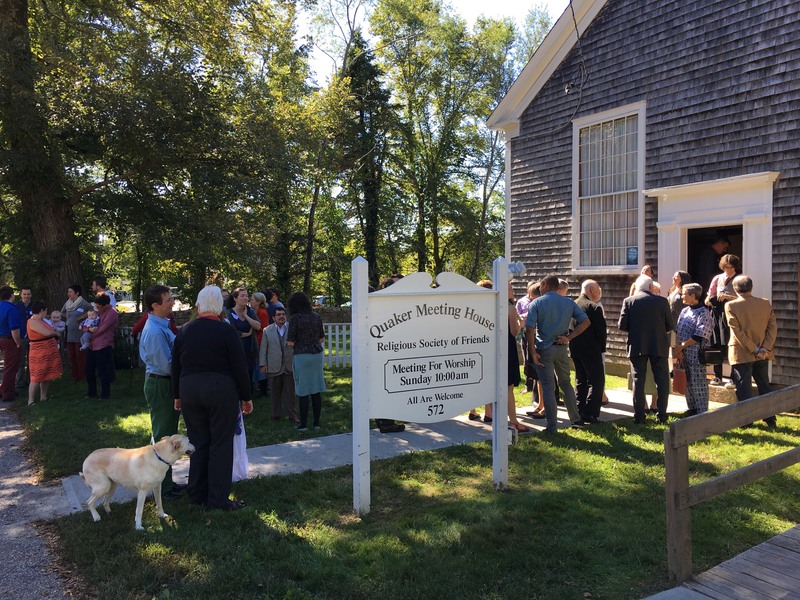 Providence Friends Meeting (“Quakers”) affirms that we celebrate the Light in every person – regardless of origins, immigration status, sexual orientation, gender, color, race, religion, ability status, or political affiliation. We affirm the right of each human being to worship, work, live, and love in peace, without fear of violence or persecution. Along with other faith communities that share these values, we stand with those facing discrimination, poverty, violence, stigma, fear, or isolation, and stand ready to offer safety, comfort, encouragement, and love. And a variety of other messages contributed…. Providence Friends Meeting is my home! We have a strong community spirit. I am glad our meeting is here, where I have met great people, made friends, and become a better person. 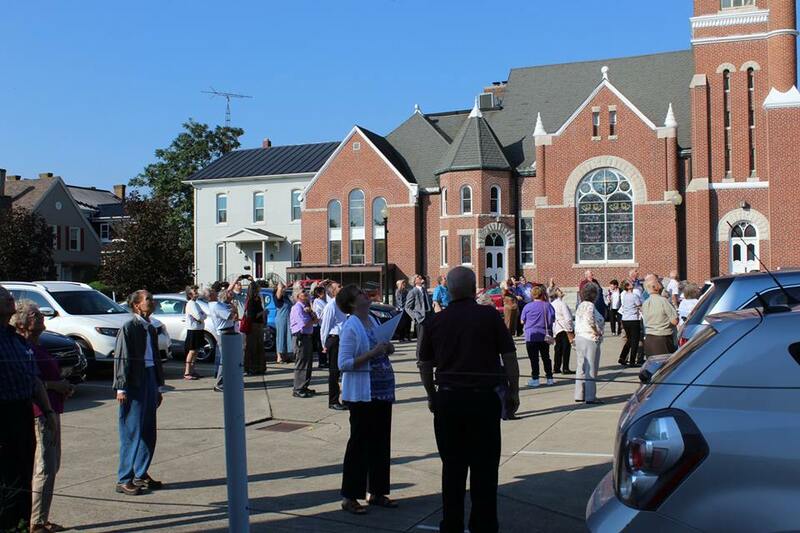 Providence Friends Meeting welcomes students, travelers, and a broad range of spiritually and secularly interesting people as a community to reach out to the larger community. The first day school is awesome! The Meeting is welcoming to single parents! We are expanding the Meetinghouse to accommodate our lively first day school. Love is love. John loves Bill. Bill loves John. Best gathering of every week – anywhere! We are not sheep. We are God’s cats! We have a lot of different ages. We are expanding our building to have more room. We respect everyone’s opinions and listen to everyone. Worship is deep! I love the silence. We have a very beautiful meetinghouse. Providence Friends Meeting helps me to be of service to the world. from Friends in Providence, Rhode Island! 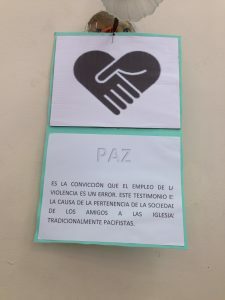 On World Quaker Day, Friends from Puerto Padre made a celebration with the theme "Crossing cultures, sharing stories" Children had a lesson about how Jesuschrist was able to cross the barriers of gender, ethnic origin, country, to come close to people, specially through the story of the Samaritan woman. The missions that came to Cuba in 1900, had to cross all kinds of cultural barriers as well. It was also briefly spoken about the history of Quakerism. Children share their owns stories, and draw pictures to share with all the Friends from the World, specially to Wellesley, all the New England Friends, and Wilmington Friends (Founders of our meeting and College, building that is being reconstructed and where the picture was taken). We are multi-cultural community, and working to become increasingly bilingual (Spanish/English.) We worship together for the first half-hour with hymns and scripture. 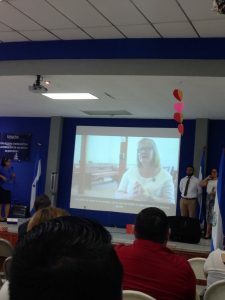 When this picture was taken the Latino community was still in worship, and the Anglos had heard Kara Newell Wilkin's message, based on Acts 16:13-14, and had shared open (unprogrammed) worship. 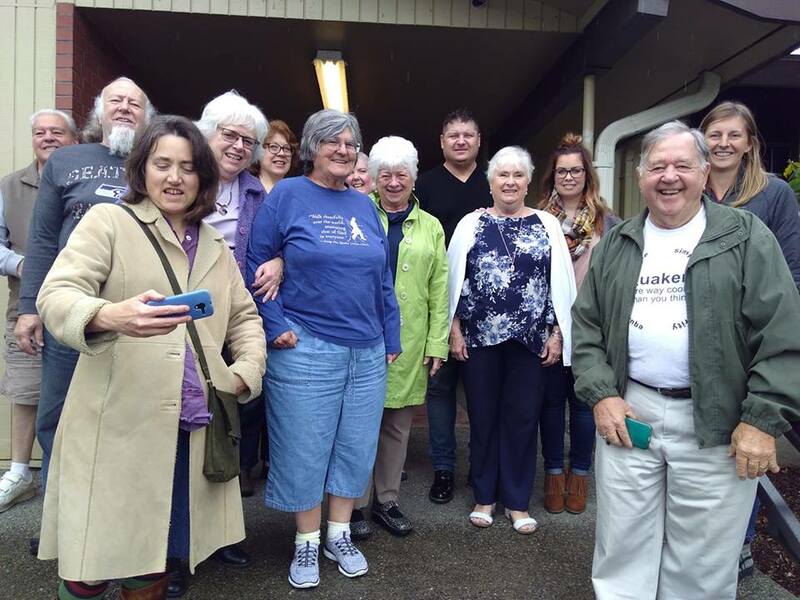 Saratoga and Easton Friends Meeting sharing the day with “Roots of Injustice, Seeds of Change” workshop on October 6, 2018. 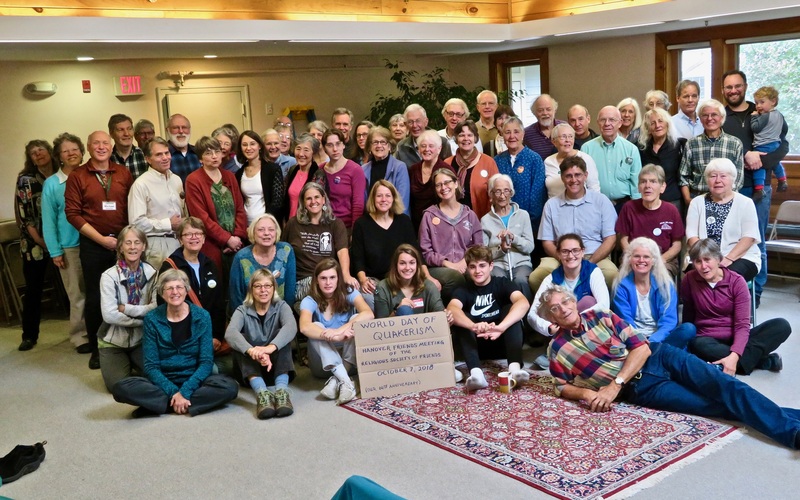 The Quaker Social Concerns Network is a group made up of representatives from the various unprogrammed Meetings and programmed Church in the Seattle, WA area. 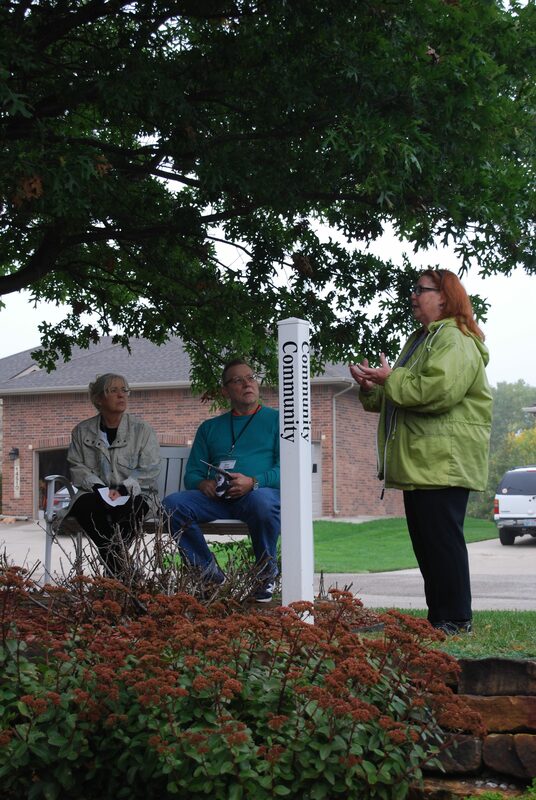 We hosted an event on October 6th. 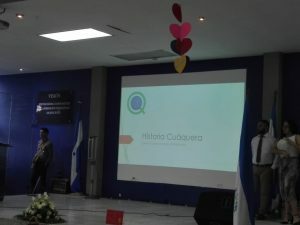 Several speakers shared stories about their experiences with Quaker communities around the world. We also sang songs, had a potluck lunch, and made origami cranes. We held an open house for the public in our town that included a short period of worship, tour of our historic meetinghouse, a powerpoint program about Quakers, and for the kids paper dolls they could make of Moses Sawyer (a member of our meeting who was a leader in the underground railroad and who actually used the local railroad to carry the slaves safely in a boxcar of wheat from NH to Montreal) and of Alice Whittier Jones who went to Ramallah in 1919, repaired the school and taught there 30 years and had Whittier Hall named after her. 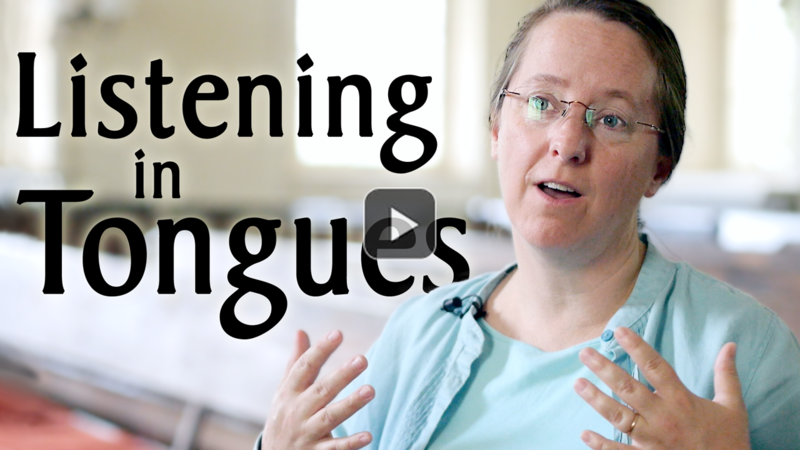 We had close to 100 people come through learning about Quakers, many for the first time. A great day of outreach. We were pleased to share the Quaker District and our Meetinghouse with so many visitors this afternoon. 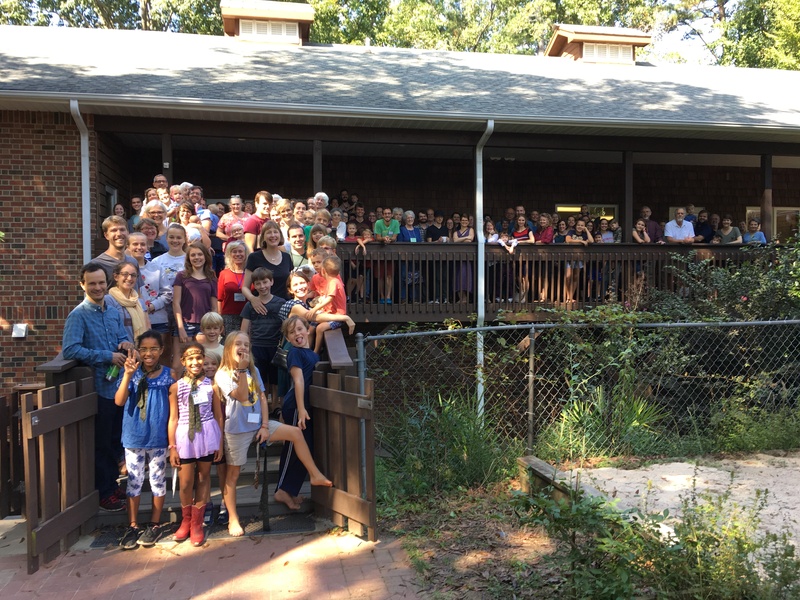 Our sincere thanks to the Quaker District School for opening their doors as well! 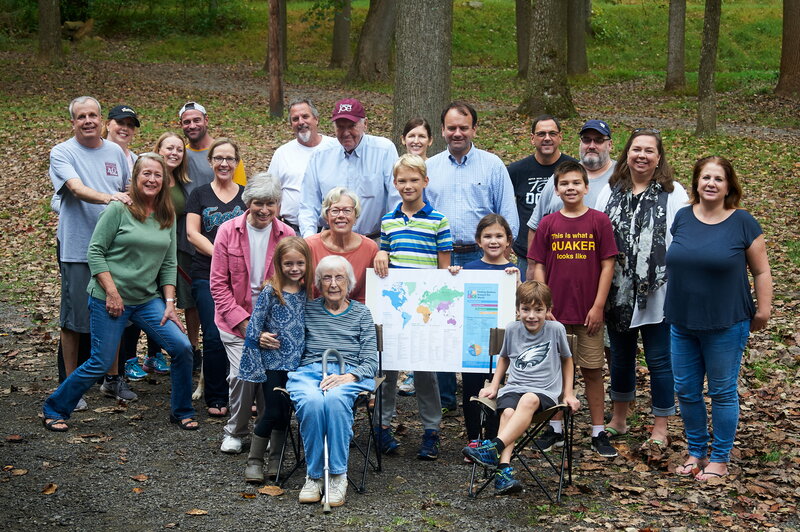 Wellesley Friends Meeting celebrated 2018 FWCC World Quaker Day with a display of photos of Friends from the four world Sections of FWCC, which were posted on the WQD website from previous WFD celebrations. 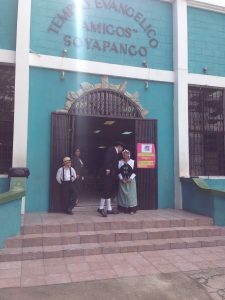 As part of WQD celebration, we received and sent greetings to Puerto Padre Friends, Cuba YM, our sister monthly meeting through Puente de Amgios, New England Yearly Meeting's sister meeting with Cuba Yearly Meeting. Friends gathered for our annual pancake breakfast at a local park, and enjoyed conversation and time to play together. 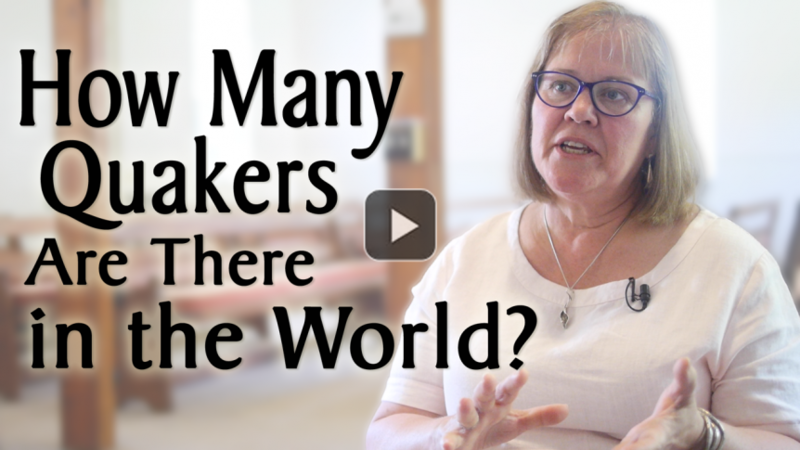 We used the art project from the FWCC "Where are the Quakers in the World?" 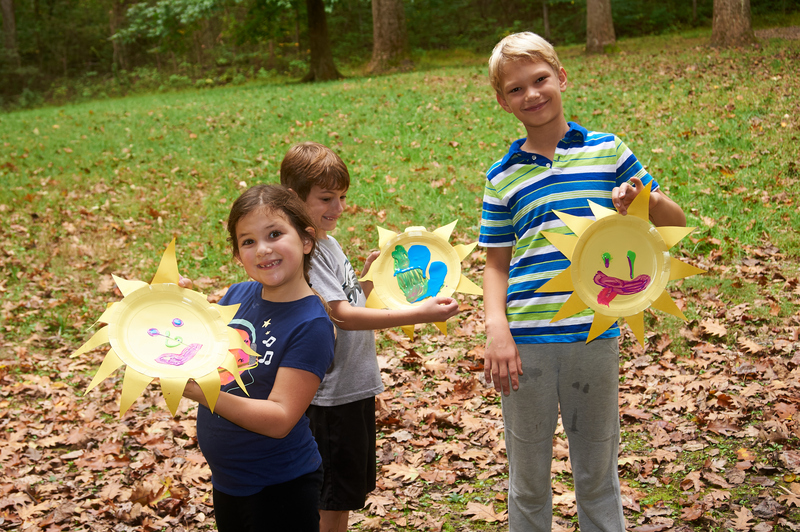 curriculum to make suns representing the journey of the sun rising over Quakers around the globe. 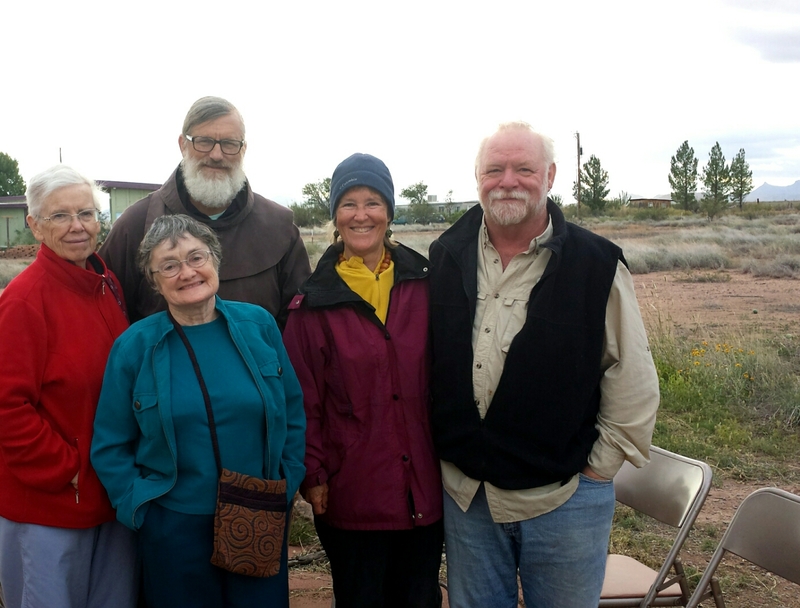 Some Friends went on a hike during worship and others sat in waiting worship; all appreciated the beauty around us on a lovely autumn morning. On this First Day we met for meeting for business at West Falmouth Preparative Meeting in Massachusetts. 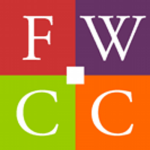 This monthly Meeting meets only for business, and is made up of three preparative meetings that worship weekly (West Falmouth, Yarmouth, and East Sandwich). 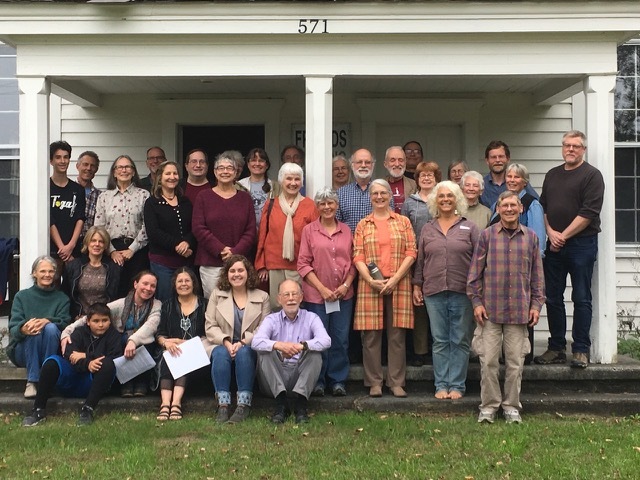 It is the only meeting in our Yearly Meeting that uses this older structure of organization - and the oldest continual meeting in the United States. 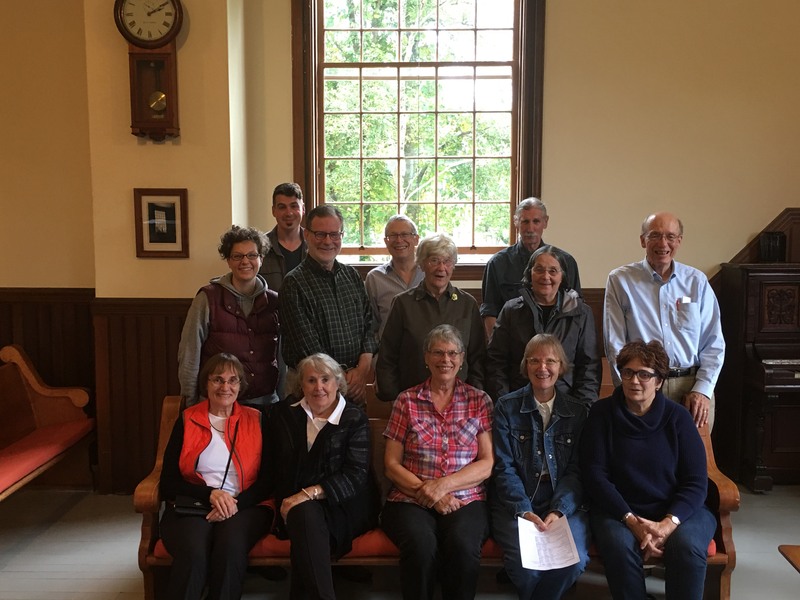 The unprogrammed meeting for worship was filled with visitors from a weekend where we celebrated a wedding, with singing and joy - and business meeting discussed the work of the meeting on Cape Cod and in the wider yearly meeting. Visitors included Kathleen Wooten (Fresh Pond Meeting), Honor Woodrow, Framingham MA (NEYM M&C clerk) and Noah Merrill, Putney Friends Meeting (NEYM Secretary). O Divine Master, grant that I may not so much seek to be consoled as to console, to be understood as to understand, to be loved as to love. For it is in giving that we receive; it is in pardoning that we are pardoned; and it is in dying that we are born to eternal life.